hi everyone! 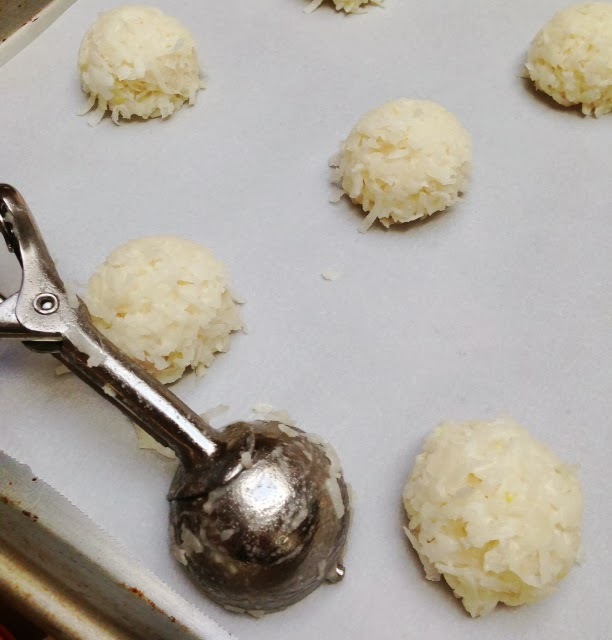 for the last couple of days i’ve been trying a bunch of recipes for coconut macaroons. it all started when i bought some of these yummy store bought cookies for my daughter who is gluten intolerant. to be honest, i had never had a coconut macaroon…hard to believe. :o) so this week, i found some recipes and thus began my journey to homemade macaroons. this process wasn’t a smooth one and i had 2 batches that were a complete flop (see photo below)! 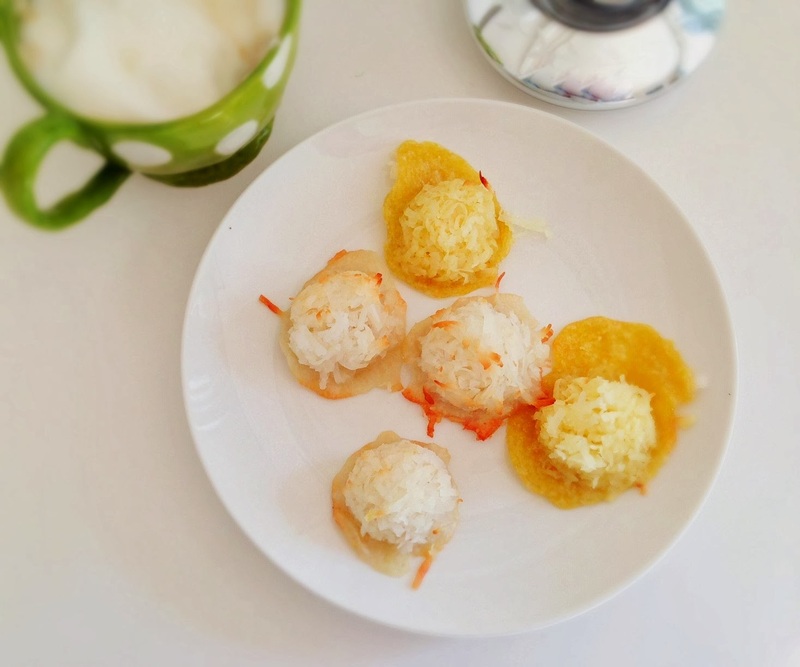 so, i’m sharing my final recipe that i came up so that you can enjoy these coconut macaroons. i’m sure our local grocery store was wondering what i was doing with all the numerous bags of coconut i bought! well, i think i won my husband’s heart by making these delicious cookies. also, my daughter can enjoy them too which makes it a double success story! Happy Valentine’s Day to you! preheat oven to 325 degrees. line cookie sheets with parchment paper. 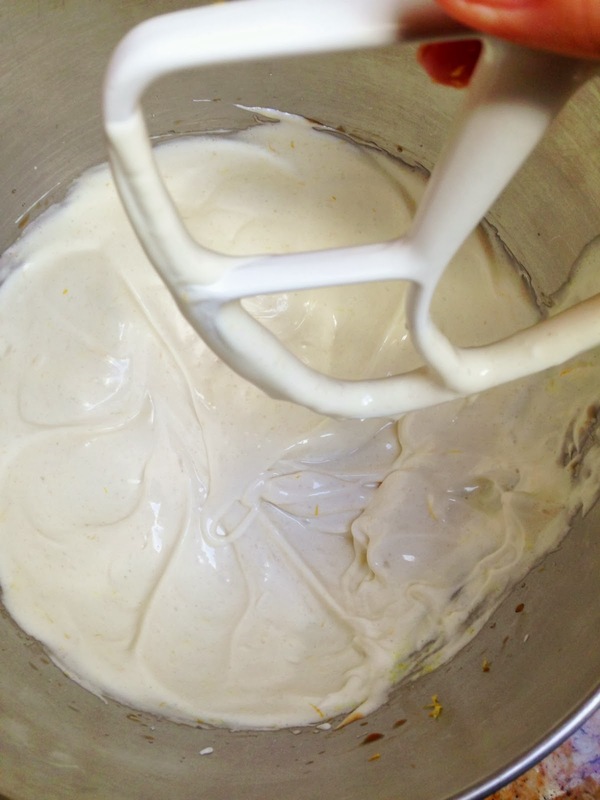 with either a hand held mixer or a standing mixer (use paddle attachment) whip egg whites on high to medium speed until they are smooth and somewhat thick consistency. here’s what mine looks like. at this point add the sugar, vanilla and almond extract and lemon zest. mix well. here’s what happens if you don’t whip the eggs, the batter is runny and you get cookies that look like a fried egg! next fold in coconut. i definitely used a whole package and then about a cup from another bag. 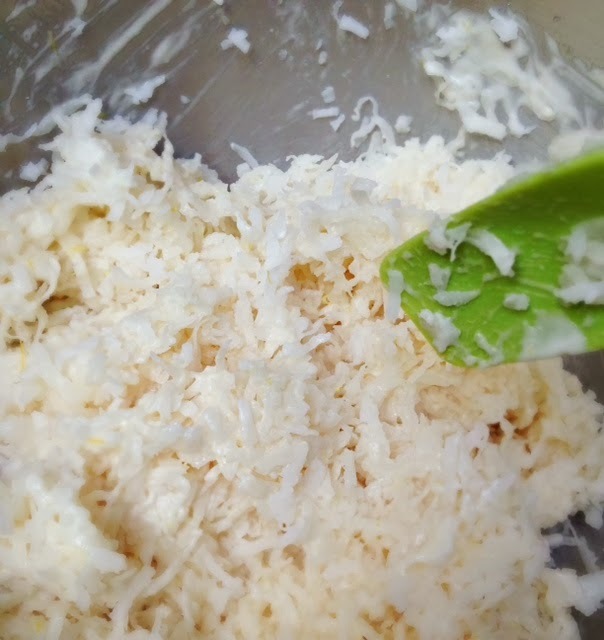 add as much coconut so that you get a consistency similar to the above photo. the mixture should be like a rice that is sticky and not watery. if it is watery, you didn’t quite beat the egg whites enough or you didn’t add enough coconut. i had this problem with the first batches i tried. you’ll want to shape them in a small ice cream scoop. so i went out and bought this great melon/cookie scoop. and i noticed that not all of these scoops are made equal. i paid a pretty penny for this one and the ejecting mechanism is smooth and effortless! when filling the dough in the scoop, pack it firmly or it will fall apart when you place it on the cookie sheet. 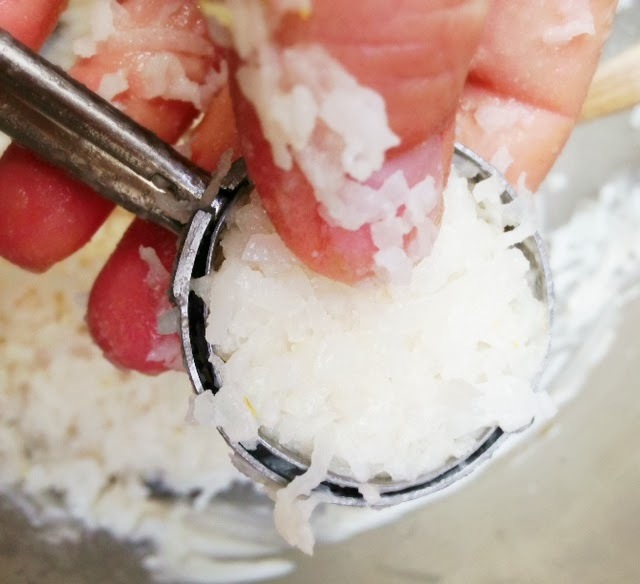 you want to make sure the bottom doesn’t have excess coconut. these cookies don’t spread much so you can place them close together on the cookie sheet. i didn’t do that here, but i figured this out eventually. bake for 20 minutes and they should be perfectly toasted. i did dip them in chocolate and the cookie kind of fell apart, i feel like the moisture just is too much for the cookie. Oh Ashley, you are totally right..I was suppose to write 325 degrees! Sorry about that. Hope you were able to make a few without burning. I left mine out in a glass cookie jar and I think they got better as time went on. The outside got crunchier and the inside was still moist. I would actually try dipping them in melted chocolate a couple days later after they harden up a bit. Although…I really did like them plain! Thanks for visiting my page! Cute baby! Way to go trying again and again until you figured the recipe out. These look so light and delicious! Can't wait to try them. I would like to make these for my uncle's 90th birthday, but I need to make them 2 days ahead of time. How do you suggest storing them to keep them fresh? Thanks so much for visiting our blog! These macaroons will hold up if you make them 2 days ahead. I feel that the crunchy outer layer is a nice thing! I just put our's in a tupperware container, nothing too fancy. That is so awesome that your uncle is turning 90 y/o!!! Congratulations to him! I hope he enjoys the cookies! PS drizzling chocolate on them is also yummy! Hunt No More, Here are My 12 Best Pumpkins!